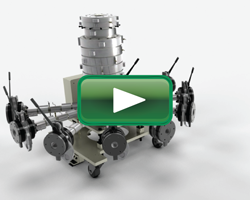 Flythrough animation of Macro's barrier double-bubble film extrusion system for producing high barrier biaxially oriented films for food packaging applications using PVdC, PA and EVOH. 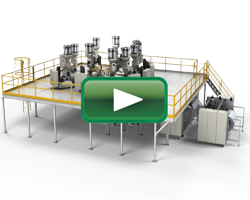 Flythrough animation of Macro's 9-layer blown film coextrusion system used for the production of high barrier films used in food and medical packaging. 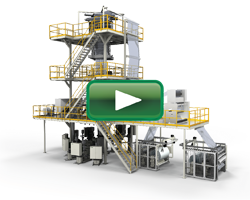 Flythrough animation of Macro's CPP/Barrier film extrusion system for producing CPP films or barrier cast films that are used in the food packaging and converting industries. 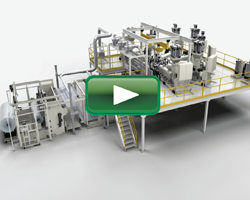 Animation of MacroPack-TP blown film coextrusion die used for the production of high barrier multilayer films for food and medical applications. 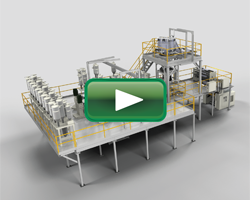 Flythrough animation of Macro's 9-layer cast film coextrusion system for producing high barrier films that are used in the food and medical packaging industries. 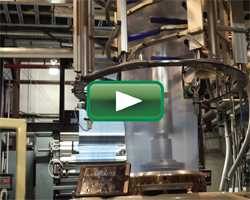 Demonstration of MacroPack-FP blown film coextrusion die used for the production of high barrier multilayer films for food and medical applications.